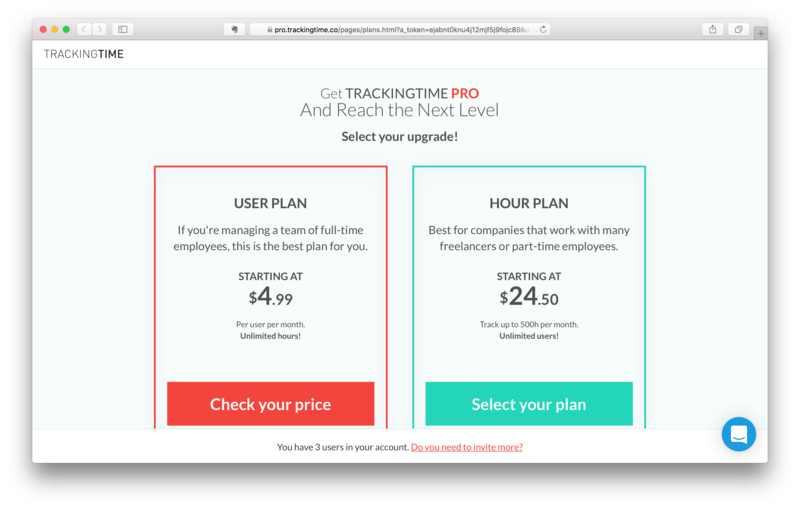 Learn how to subscribe to TrackingTime PRO and upgrade your account to get access to all premium features. 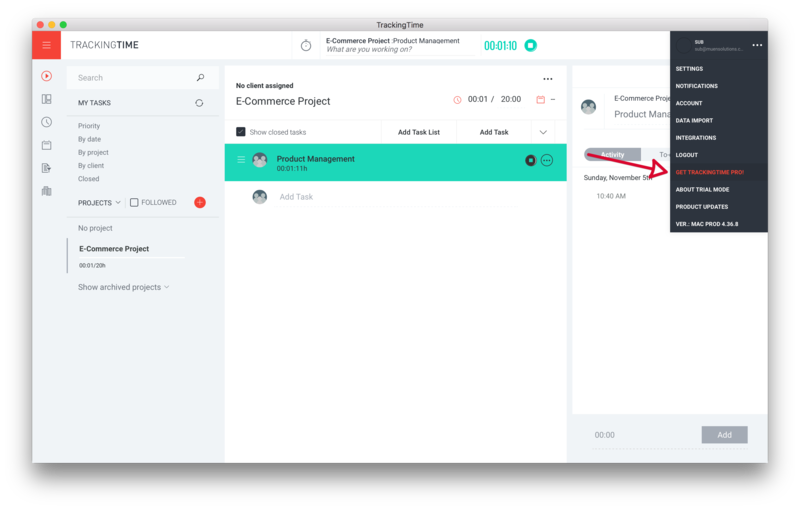 This article describes, step by step, how to upgrade your TrackingTime account to the PRO version and get access to all premium features. Please note that only account administrators are allowed to subscribe to a paid plan. 1. On the menu button on the top right corner of the screen, select "Get TrackingTime PRO". 2. Select the plan that's right for you. You can choose between the standard user plan with unlimited hours, or one of the hourly plans with unlimited users. 3. After selecting your plan, enter your credit card details to upgrade your account. The monthly subscription fee displayed on the pay button is calculated based on your selected plan. That's it! After successfully processing your payment your account will be switched to PRO and you'll get instant access to all premium features. We'll then automatically charge your credit card on file every 30 days. 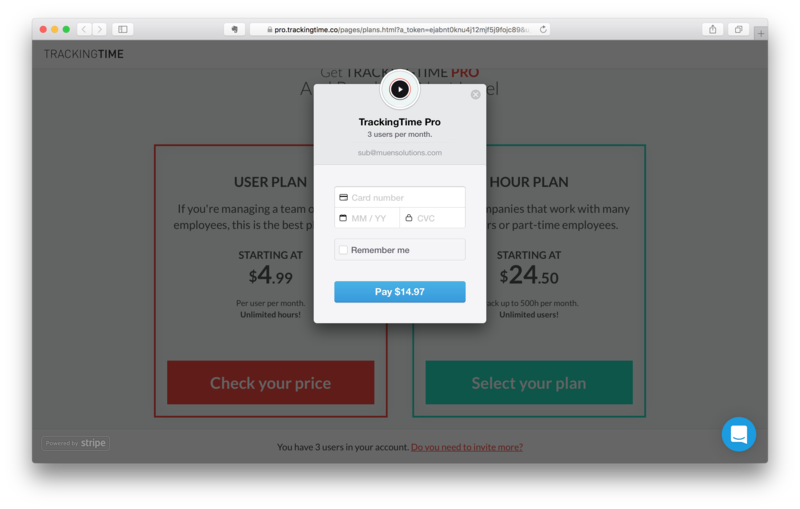 At TrackingTime, you only get billed for the people who use it each month. User fees are automatically prorated, so that you always end up paying only for the exact amount of time that a user has been marked as active during a given billing period. For instance, if you add a user at the middle of the month you'd only pay $2.49 for that user for the current billing period, instead of the full price of $4.99. All automatically calculated prorated fees will be detailed in your invoices. If for whatever reason you aren't satisfied with TrackingTime PRO, just let us know within the first 30 days after subscribing and we'll issue a full refund of your payment. Please note that we don't offer refunds (full or partial) after the initial 30 days. But there are no longterm contracts and you can cancel your PRO account anytime.